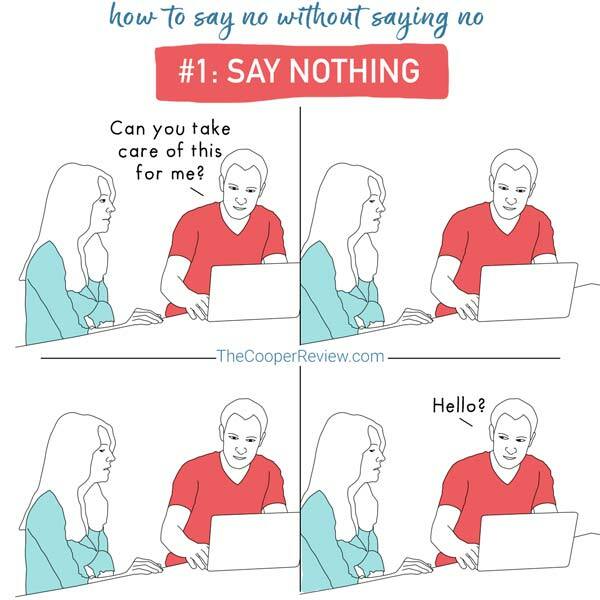 Saying no is especially hard for people-pleasers. That’s why it’s good to have a game plan with many options of how you can say no by avoiding saying no. 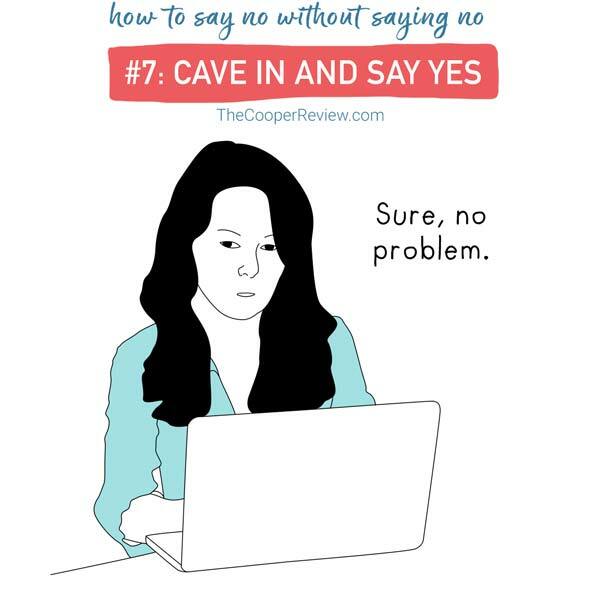 Here’s seven tips for how to say no at work without ever saying no. 1. Say nothing. Sometimes if you don’t respond to the request at all, it simply goes away. Sure, the requestor could think you’re being rude but don’t worry about that part for now. 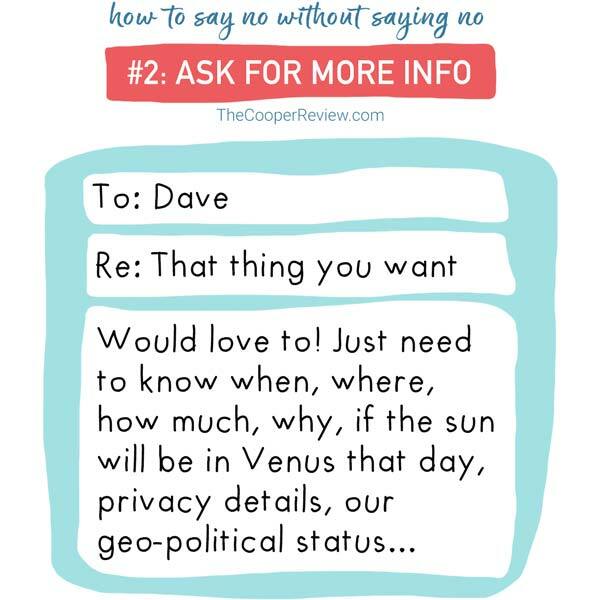 For now, just stay silent and bask in the glory of avoiding saying no. 2. Ask for more information. Once you receive the second request, ask for more information. Ask for some information that would be impossible to get. This way you really may never hear from them again. 3. 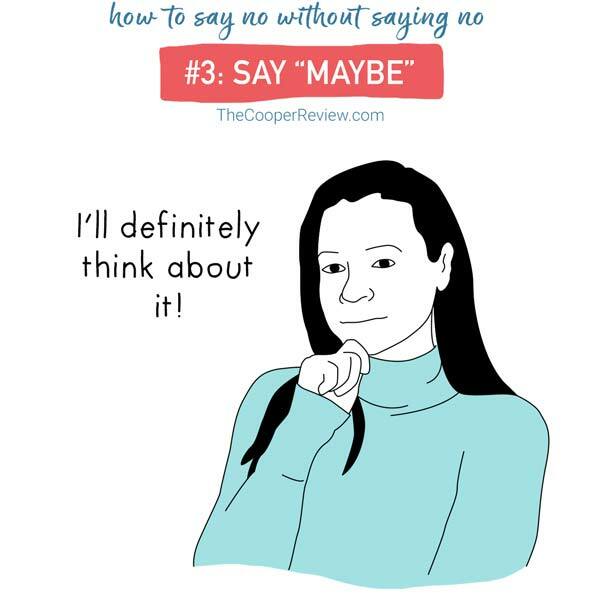 Say “Maybe.” After they get back to you with that information you were sure they wouldn’t have, say you’ll have to think about it. Give them a definite maybe. 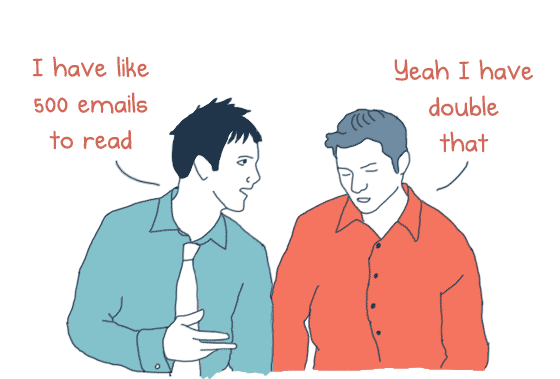 Then just never respond to them. Once again, you can rest assured knowing you’ve avoided a confrontation. 4. 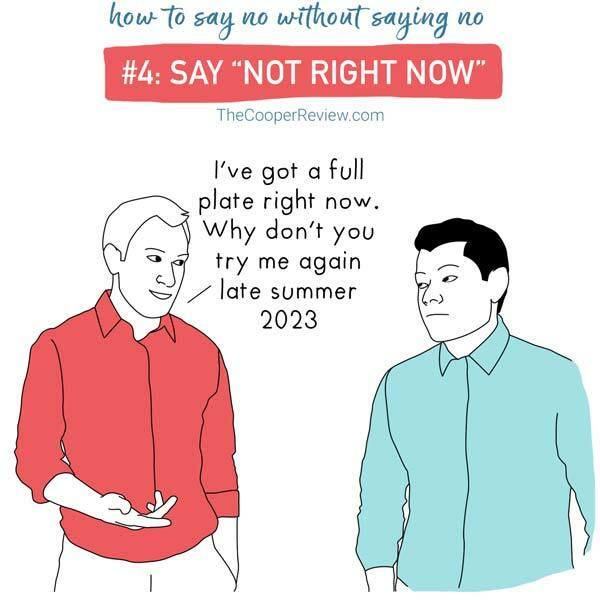 Say “Not right now.” After they don’t forget about it, say that now isn’t a good time. Say you’ve got a full plate of responsibilities right now. When they ask you for a better time, give them a very specific time in the very distant future and they likely will have totally forgotten about it by then, or did it themselves or asked someone else. Either way, you got away. 5. Say you’ll get back to them. 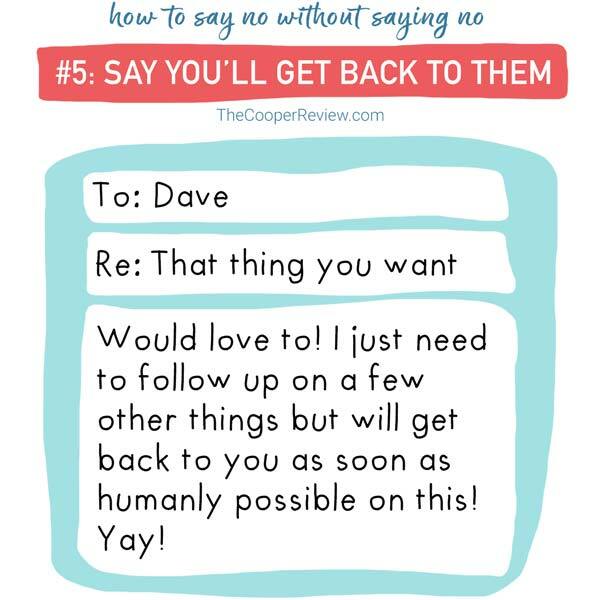 Saying you’ll get back to them is a great way to say no. You can say how much you really want to do this thing, but then also appear as if not doing it may just be out of your hands due to how busy you are. 6. 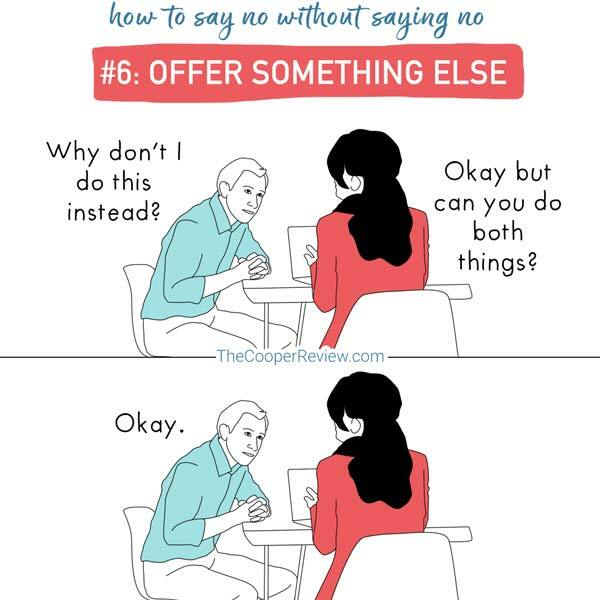 Offer something else instead. Maybe there’s something else you could do instead of that thing you’re being asked. This will make you look generous without having to say no to that thing they were asking you to do. But keep in mind, you may end up having to do both things now. 7. Say yes. Saying Yes is the easiest way to say No. It means you can make the other person happy and you can make myself momentarily happy because you feel like such a great employee. Just beware that the dread of actually having to do this thing will set in quickly, and then you’ll probably end up not doing it anyway, making both you and the person who asked you to do the thing both very, very miserable. If these steps don’t work, try being honest, saying no firmly but kindly and not making any excuses you’ll have to answer for later. But this is only as a last and final resort.